With all of the freezer recipes that I share here, it’s no secret how much I LOVE my freezer. I use it on a daily basis (almost as much as my slow cooker) to save money and today I’m going to show you how I do it. If you are on the fence about freezer cooking I’m going to share with you some tips and tricks that have helped me. Plus, I’ll link to several of my favorite recipes and posts along the way. Let’s get started. A great way you can use your freezer to save money is to buy in bulk. Prices are normally cheaper per ounce or per pound when purchased in bulk so when you use your freezer to preserve food that’s money in your pocket. Some things to consider purchasing in bulk and freezing are dried beans, ground beef, chicken breasts, oats, cheese, butter, etc. Being able to stock up when something is one sale or at it’s rock bottom price is an awesome way to save money. Around the holidays, things like chocolate chips, butter, flour and other baking supplies are on sale. I try to stock up on these items (and store in my freezer) to get me through until Easter when they go on sale again. Also, if you find a great deal on produce that freezes well such as bell peppers, cabbage, celery or onions you can really save a lot. Not all produce freezes well and some need to be blanched before freezing so make sure you do your research before stocking up. Meat is also a great thing to stock up on when it goes on sale. I regularly stock up on chicken thighs at Aldi when they are .89 per pound. We grow a large garden so being able to freeze produce while it’s in season is a huge savings to us. Berries are in season during the summer and freeze extremely well. They are great to bake with or use in smoothies. I also love to make freezer jam with them. I also use seasonal produce to make freezer apple pie filling, freezer pesto, freezer tomato sauce sweet potato purée (for baby food) and homemade pumpkin purée. You don’t have to have a garden to take advantage of in season produce. Check your local farmer’s market or produce stand and see what deals you can find. I hope this has give you inspiration to start some freezer cooking of your own. If you are considering purchasing a deep freeze then you may want to read Filling the Freezer on a Budget for more tips on how to fill it without breaking the bank. Do you do any freezer cooking? 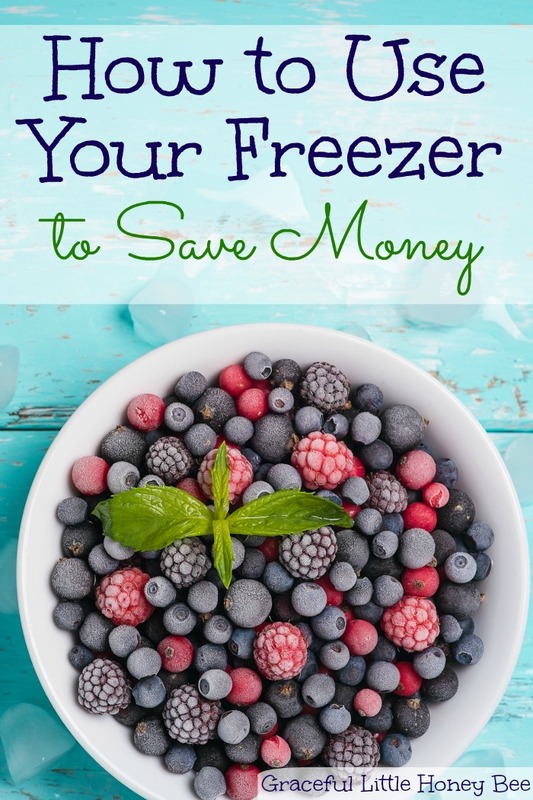 What is your favorite way to save money using the freezer? I’d love to know!